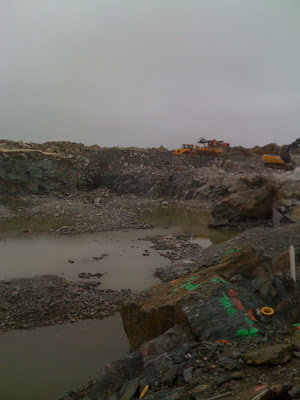 This was my first trip to visit the Metanor Resources mine and mill in Quebec. I had met with management three times and communicated with Metanor investors who had visited the operation prior to my visit. On Monday, August 11, I flew in and stayed overnight in Montreal—meeting with other Metanor investors for dinner. On Tuesday four of us drove up to Val d’or (Valley of Gold) and stayed at L‘Escale Hotel. It was a five and a half hour trip. Interestingly, we later learned that Metanor owned mining rights to the land on which the L’Escale stood. Across the street from the hotel was Metanor’s Dubuisson property. On Wednesday, we left early in the morning and drove for about two and one-half hours (225 kilometers or 150 miles) from Val d’or up to the Bachelor Lake mine and mill near Desmaraisville. 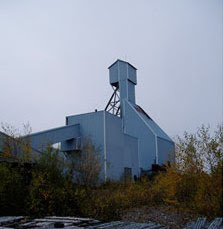 The Bachelor Lake mine is an underground operation. The mine site includes a hoist room and shaft house. We took a trip down the shaft to level 6, about halfway down the mine shaft and toured the main shaft on that level. There were several drifts, including one drift that butted up against the Hewfran property and was sealed with concrete to prevent water from Hewfran from entering the Bachelor mine. Water from the Hewfran mine can be pumped out when it is time to mine. The mine appeared to be in good condition, with very little water on the 6th level. The rock on the mine face was very dense and secure. There was work to be done to get the mine prepared for mining like fixing the rails and cleaning out loose rocks and old drill pipe. But, it seemed preparation could be accomplished quickly when the company is ready to mine the property. 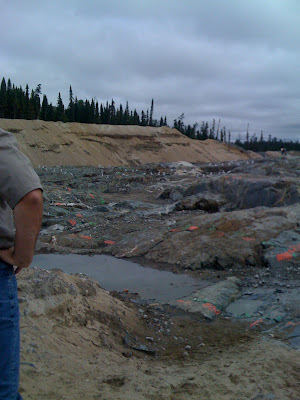 A 2005 mineral resource estimate for Bachelor Lake and Hewfran shows 54,504 measured; 156,352 indicated; and 89,366 inferred ounces of gold at Bachelor Lake. The mine is relatively high grade with 8.8 grams per ton measured; 7.49 grams per ton indicated; and 6.52 grams per ton inferred. 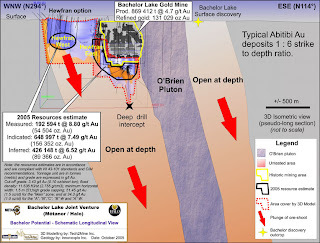 The following illustration shows the promise of the Bachelor Lake mine including the surface discovery and showing that both Bachelor Lake and Hewfran are open at depth. 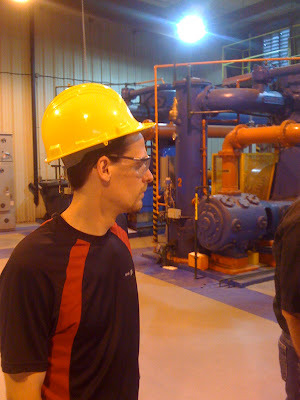 We also visited the Bachelor Lake mill on Wednesday. For investors who have never seen a mill in operation, it is a wonder to behold. The complexity of the different stages of gold production from crushing, to grinding, to separation and filtering of the gold is simply amazing. Tons of ore are run through these stages just to produce a dore bar of gold weighing anywhere from 400 to 800 ounces. The noise in the mill was so loud from all the machinery that it was difficult to speak and be heard by other people just a few feet away. The other thing I noted is that this process is very energy intensive. One of the advantages of milling in Quebec is that energy costs are about two-thirds cheaper than in the States because electricity in Quebec is powered by hydro plants. Metanor also had two huge diesel powered back-up generators just in case the local power grid goes down. Metanor keeps the mill running 24/7 and good risk management requires these generators to kick in immediately after the power grid no longer supplies electricity to the mill. On Thursday, we traveled to the Barry gold deposit about 115 kilometers by road (65 km as the crow flies) from the Bachelor Lake mill. 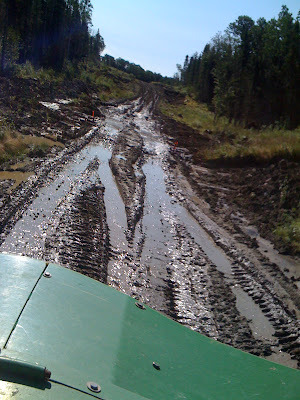 It took us about an hour and a half to get to our destination along forestry roads that were rather rough at times. Having to share the roads with trucks carrying 50 tons of gold ore was also quite exciting at times. The Barry open pit mine is providing all the ore that is fed to the Bachelor Lake mill at this time. Metanor’s strategy is to use the Barry deposit to provide cash flow necessary for developing other properties including Bachelor Lake, Hewfran, Nelligan and others. 43-101 compliant resources are estimated to be 35,000 indicated ounces of gold at 4.1 grams per ton of ore; 67,600 inferred ounces of gold at 4.68 grams per ton of ore in zones 43 and 45 and in the main zone. The feedstock into the mill has been averaging about 5 grams per ton since production has started. Of course, gold mineralization is higher in the core zones and lower in the fringe zones of the Barry pit. As the mill feedstock begins in the fringe zones, gold grades are lower than the core zones, resulting in fluctuations in the grams per ton that is milled when fringe zone ore is first being fed into the mill. The above picture is an example of why the average grade may be slightly higher than the 43-101 resources for the Barry pit. These nuggets can be found at the Barry pit. It demonstrates what is called the “nugget effect.” I believe it indicates the potential for higher grades outside the main zone as the Barry pit is expanded. The Barry pit is just a small geographic area in the much larger overall Barry property owned by Metanor. There was extensive activity at the Barry pit while we were visiting. Here is a picture of the Barry pit showing the dozens of channel sample cuts and white flags with channel samples in the upper left part of the picture that will be evaluated by Metanor’s on-site lab to help them more quickly further define gold mineralization at the Barry pit. These channel samples were designed to determine how rich the mineralization could be between two existing gold zones. We also saw the explosive drill holes that were marked for a planned blast later that day. The picture below shows the blast drill in the background with dozens of blast drill holes just to the front of the machine. Note the green markings and blast drill hole in the right bottom foreground of the picture. There is an intrusive dike (gray hard rock) that winds around the Barry pit. 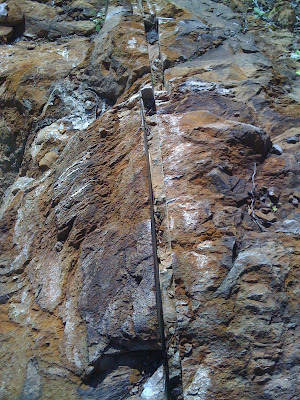 Gold mineralization has been found in rust colored ore that is tangent to the intrusive dike and interspersed with pyrite (fool's gold). The gold ore is rather fine (specks) and dispersed throughout these formations, which extend in 3 directions and at depth. In short, the gold veins continue beyond the current Barry pit out and deeper into the earth. This makes the Barry pit a very promising deposit that could be economical to mine for several years. 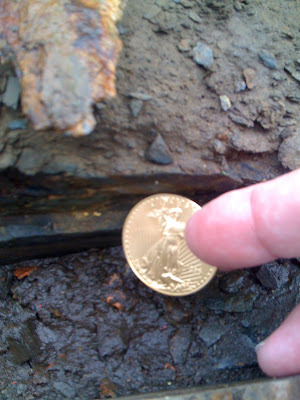 A gold pour is an amazing site to see. Two gold buttons were poured during the week we visited—one on Wednesday and one on Thursday. After days of crushing, grinding, separating, and filtering at the mill these two buttons (weighing a couple of hundred ounces each) were tossed into the furnace and after about 40 minutes or so the melted gold was poured into a dore bar inscribed with MTO-V, the TSX symbol of Metanor. 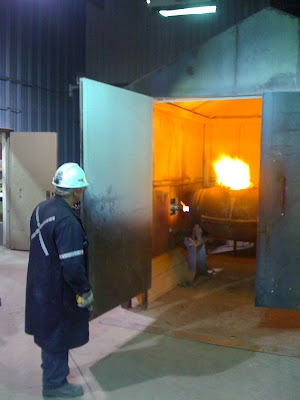 Here is the picture of Metanor’s gold being melted in the furnace. 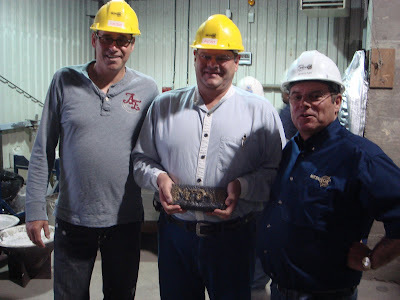 And here is a picture of me holding the gold dore bar that had just been poured with Metanor Resources President Ghislain Morin on my left and Vice President and Treasurer Ron Perry on my right. At that moment, all the work of finding the gold, blasting the ore, hauling the gold ore, crushing the ore, grinding the ore, separating the ore, and filtering out the gold specks from the mud that once was ore came to a delightful culmination. The gold bar was then shipped by armored car and sold to the Royal Canadian Mint to be made into gold coins and sold to gold coin collectors and retail buyers. On Thursday, we took a trip to the Nelligan property. Metanor has a 70 percent share of ownership in this property along with Murgor. This was an especially sweet trip as the property has already yielded a 584 gram per ton channel sample by Murgor geologists a few years ago. This is equal to about 15.56 ounces of gold per ton. The following is a picture I took of the channel cut that produced the 584 gram per ton sample. The Nelligan property is what the mining sector calls a “blue sky” project. It is unclear how much gold is in that project. But usually where gold is found in high concentration, more gold is generally likely to follow. The good news is that the Nelligan property is only 4 kilometers from the Bachelor Lake mill. Just to show you how difficult it is to get to some of these blue sky properties, I took a picture of the road we had to traverse to reach the Nelligan outcropping. Here it is. 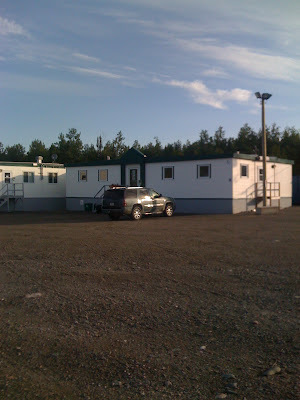 During this entire mine visit, we stayed overnight at the Bachelor Lake Camp. It is a thoroughly new and modern facility with individual rooms, wireless internet access, a camp mess hall, weight room, and televisions for the miners. 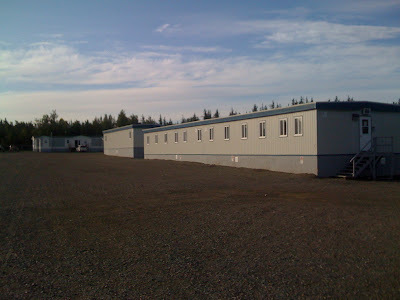 The camp facilities are an attraction to workers throughout the area. On a personal note, the food was very good and I may have gained 5 pounds eating like a miner for 3 days. The camp, less than a year old, is also enclosed with a fence to keep out trespassers and bears—a necessary safety precaution. We saw several bears while traveling between properties. Here are pictures of the camp. So far, Metanor Resources management has hit their milestones. They are milling gold ore from a producing open pit mine and have a sustainable business plan. The Metanor management team is very passionate, resourceful, and talented at what they do. Most importantly, they are able to attract top mine managers, geologists, miners, prospectors, and ore millers. They also have the latest technology at the Bachelor Lake mill and that helps to reduce the number of hires and labor costs. Metanor Resources employs about 60 people at both the Bachelor Lake mill and Barry pit. Metanor management is focusing development on the Barry pit to maintain production and cash flow—very important in the current junior gold miner markets. The development of the Bachelor Lake mine, Nelligan property, and other mines will proceed over the next few years as the Barry pit provides cash flow for their development. In this tough financial environment, my sense is that only producers will survive the current liquidity crisis. Money is tight and the failure rate of junior gold miners is high. Metanor is better positioned than almost all emerging junior gold producers based on their past record of success, debt free by December of this year, minimal risk of future shareholder dilution, and steady managed growth strategy. There are two major risks to the Metanor story in my opinion. The first risk is the price of gold—which the company has no control over. A declining price of gold would reduce margins and reduce free cash flow. The second risk is rising cost of production (energy, labor) faced by all gold producers. This risk is somewhat controllable by management and as a Quebec miner (low-cost hydro power) with a solid local reputation (good for recruiting talented labor), Metanor has several advantages for keeping costs low. They also get a 47% tax credit from the Province of Quebec for exploration expenses on non-commercial producing properties. Mine grade is also a component in the production cost calculation as lower grades reduce the yield of gold produced, increasing costs relative to lower gold production. Having the Barry pit producing higher average grades than projected is also a positive factor. However, there are no guarantees this trend will continue into the future. For those familiar with the Quebec regulatory regime, Metanor Resources is still formally operating as an exploration company and not as a commercial producer. This status favors the company as they receive a tax credit from the Provincial government for exploration activities. It also provides several months of bulk sampling to refine the mill operations before officially going into commercial production. This status effects the financial statements as any gold sold on the market is an offset to exploration activities and is not recorded as revenue. For novice investors, this causes considerable confusion. It is hoped that Metanor Resources will receive the necessary permits to become an “official” commercial producer within a few weeks. There are a lot of exciting things going on at Metanor Resources. I’m reminded that for every junior gold mining company that succeeds in getting to the production stage, scores of companies fail. The Val d’or area is filled with companies that couldn’t make it to the production stage—many for lack of financing. And many of these companies still have rich deposits looking for a place to be milled. It is my hope that Metanor Resources will be the consolidator of mines in the Val d’or region. There are also many nearby properties with less than 100,000 ounces of gold. As Metanor has the only mill in the area, these nearby properties are likely to be mined and milled at Bachelor Lake. Time will tell. Full disclosure: I own shares in Metanor Resources. The information provided in this post is believed to be correct, but not guaranteed. Investing in junior gold miners entails risks. Readers are responsible for their own investment decisions. Do your own due diligence.